According to astrology, days and nights are divided into 12 signs, and every living being is born under one of them. Each sign has its specific impacts. There are nine goddesses associated with these planets. Similarly, there are nine avatars of Goddess Lakshmi, one associated with each planet. 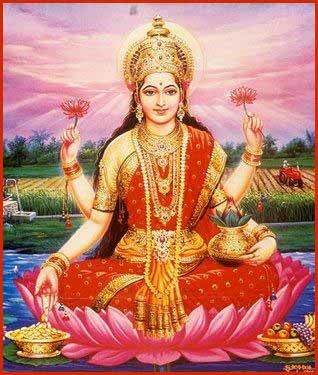 All the nine avatars of Lakshmi are worshipped. Given below is the description of Lakshmi's nine avatars associated with different planets. We have also provided information on the positive and negative impacts of these planets. Chandra (Moon) Lakshmi: Positive effect is good health, while negative influence includes ill-health. Budh (Mercury) Lakshmi: With the help of Mercury, you can achieve gold medals in school and college; otherwise, you will have to be satisfied with just a consolatory result. Shukra (Venus) Lakshmi: If you want a good wife, worship Venus; but the evil eye of Venus may give you just the opposite - a wicked wife. If blessed by the nine avatars of Lakshmi, our life can become perfect. Following is the ultimate mantra which, when recited by a person, can help him/her attain salvation.